It has been a while since I reviewed the DroidBox M7 Android tv box and I was hoping to make it a regular occurrence due to it’s popularity. Unfortunately we got caught up with other reviews and the Android boxes took a back seat, until now that is. 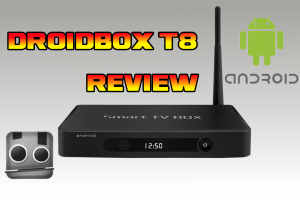 We are back with another review and this time we are looking at the DroidBox T8. With it being built around the Amlogic S802 Neon Cortex architecture with octacore Mali-450 GPU it all looked great on paper but how did it actually perform in real life? I have listed the specs below followed by our full video review. Accessories: HMDI Cable, A/V Cable,Power Adapter, Remote Control, Manual. If you liked what you seen then you can pick the DroidBox T8 Android Box up HERE. If you have any questions be sure to let us know and we will answer as many as possible.